The Khandadhar waterfalls is a favourite picnic destination of many college students in Odisha. But it may soon be a pleasure of the past. The falls spring out from the Khandadhar hills that are home to 69 working sponge iron units. And with more than 150 mining projects approved, the hills, which divide Sundergarh and Keonjhar districts, look set to become a mining haven. The Juangs, Paudi Bhuinyas (primitive tribal groups) and Mundas, Kisan, Sabars, Kols, Santhal, Kuda, Bhumija, Bathudi, Maria and Gonds living in the districts are at risk of displacement, and a rich biosphere comparable to the much-in-news Niyamgiri range (home to the Dongria Kondhs) stands to be ravaged. The biggest threat to the hills and its inhabitants is the South Korean steel giant POSCO. The company’s project to build a 12 million tonnes per year steel plant in Odisha, with a captive port and iron ore mines, is widely celebrated as the single largest infusion of foreign direct investment since the Indian economy liberalised in 1991: US $12 billion. Currently locked in a battle with people in Jagatsinghpur district who stand to lose their livelihoods, POSCO plans to mine 6,100 acres (nearly 2,500 hectares) of forestland in Sundergarh. The mining will imperil the future of 64 villages, home to the Paudi Bhuiyan and many other tribal and non-tribal communities. The springs in the hill, the water source for more than 200,000 people in Lahunipada, Koida and Gurundia blocks, will dry out. Already, miners, including the state-owned Odisha Mining Corporation, have ravaged hundreds of perennial hill streams in the hills—despite a Supreme Court ruling that perennial water bodies should not be threatened. Some of the best quality minerals are available near the springs in the hills. POSCO has signed a memorandum of understanding (MoU) with the Odisha government which allows the company to export iron ore from Sundergarh. The Ministry of Environment and Forests has objected to this clause in the MoU, but not the Ministry of Commerce. Things might not, however, be easy for the company. Sundergarh is a scheduled district and the gram sabha’s assent would be required for mining. Padi Bhuiyan and other communities who survive on sal seed, mahua, tamarind, char and resin, which is sold to middlemen and state-owned agencies—who sell it for huge profits—are not likely to consent to the destruction of their homes and forests. Other villagers detailed how the government is preparing the turf for POSCO and other mining companies. The Forest Rights Act is being violated with impunity and applications for land pattas on forests in Khandadhar are being regularly tampered. Most residents who have received pattas claim they had applied for two to three hectares (ha). But they have received not more than 0.4 ha. 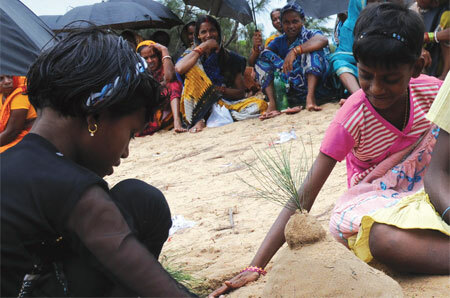 The forest department officials are busy planting trees as part of their afforestation campaign on adivasi lands. Boards that read CAMPA (Compensatory Afforestation Fund Management and Planning Authority) dot the mining blocks of Sundergarh.